Staples’ Players, musicians, Inklings newspaper staff, athletes and robotics teams all earn statewide and national recognition. Add one more to the list: the high school Science Olympiad team. 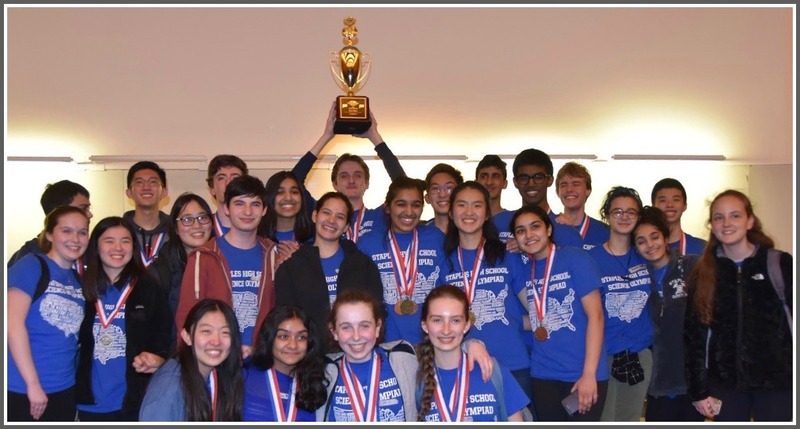 The “A” team snagged first place Saturday, in the Connecticut State Science Olympiad competition, at the University of Connecticut. Science teacher Karen Thompson’s squad beat out 48 other teams, and won 12 medals. That’s more than half of the 23 events contested. The Staples “B” team won one medal too. The win vaults Staples into national competition. But they won’t be alone. Last month, Bedford Middle School won its state event. Both teams advance to the 35th annual national Science Olympiad at Cornell University on June 1. To prepare for the state competition, many Stapleites worked closely with the middle schoolers. The older Olympiads visited Bedford to work on labs, build various contraptions and study for test events. Congratulations to the “A” — really, the A+ —team: Emma Alcyone, Justin Berg, Hannah Even, Zach Katz, Angela Ji, Sophia Lauterbach, Annie Liu, Augustin Liu, Aniruddha Murali, Nishika Navrange, Neha Navrange, Samuel Powell, Sirina Prasad, Anisa Prasad, Carter Teplica, and Derek Ye. The Staples Science Olympiad A and B teams.